I always tell my clients, friends, family…pretty much anyone who will listen to me, about the wonderful benefits of cinnamon. Besides its warming, welcoming flavor, cinnamon has antibacterial and antioxidant properties. The reason I recommend it though, is because of its anti-inflammatory properties. I use cinnamon everywhere I can as a way to combat my severe arthritis, and have recommended it to several clients who have reported feeling better when using cinnamon regularly. I am a big fan of drinking hot water with lemon in the morning (another healthy habit I recommend to my clients) and when I want a little extra boost, I’ll swirl a cinnamon stick around in there. You can also stir a stick of cinnamon in a cup of hot water and fresh ginger for an interesting anti-inflammatory tea. While most people think of cinnamon in terms of sweet dishes like cookies, oatmeal, and sweet breads, cinnamon can be an interesting twist on savory dishes as well. Try adding a teaspoon of cinnamon to your chili, stew, or curry dishes, or add some to your dry rub for meat. Cinnamon is especially lovely with pork (I hear…you guys know I don’t eat meat)! You can also make my World’s Easiest Cookie recipe with lots of cinnamon for an added punch. Visit my website, http://www.thecaringcoachingcenter.com and click on the recipe tab to snag it. Ah, the humble chia seed! If your only experience with chias is the Marge Simpson or Duck Dynasty Chia Pet that you got as a Christmas gift, you’re missing out on this powerful little seed that packs a healthy, nutritious punch! People ask me all the time if these are indeed the same seeds, and the answer is – YES! However, don’t worry that you’ll suddenly sprout a crazy beard; chia seeds are really good for you! Chia seeds come in both black and white varieties and are loaded with omega-3 fatty acids, protein, fiber, and antioxidants. Chias are also gelatinous, which means that they get a tapioca-like consistency; the gelatinous factor, coupled with the fact that chias are a high source of fiber, helps you feel fuller longer. You can add chia seeds to smoothies, oatmeal, yogurt, cereal, etc. You can also get creative and add chia seeds to your pancake mix, sauces, and rice dishes as well. You can also make your own chia pudding (see recipe below). 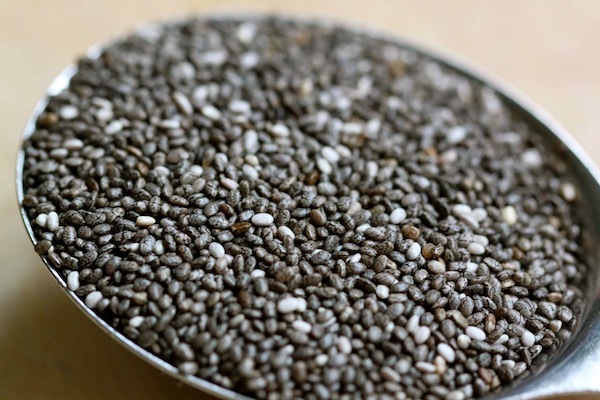 The jury is still out on whether or not chia seeds will help you lose weight. I can only speak from personal experience, and my experience has been that adding chia seeds to my diet routine has helped me feel fuller longer, causing me to eat less, which has helped me shed a few pounds. So, there you have it, a mighty little seed that packs a powerful punch! Whisk coconut milk, yogurt, maple syrup, and vanilla until blended. Mix chia seeds and let stand 30 minutes. Stir to distribute the chia seeds, cover and refrigerate overnight. This is your base, from this, the possibilities are endless. Add in fresh berries, cacao powder and banana, coconut and vegan chocolate chips; whatever you’d like! Take care of yourself, be nice to yourself and be well. And until next time – veg in, don’t veg out! Summer is officially here! I don’t know about you, but this is the time when I tend to crave lighter, more hydrating foods. If you haven’t tried juicing yet, summer is a great time to try it. Why? 1. There are a lot of great fruits and vegetables in season. 2. Juices are cooling and re-hydrating during the hot summer months. And…best of all…two words… NO COOKING! 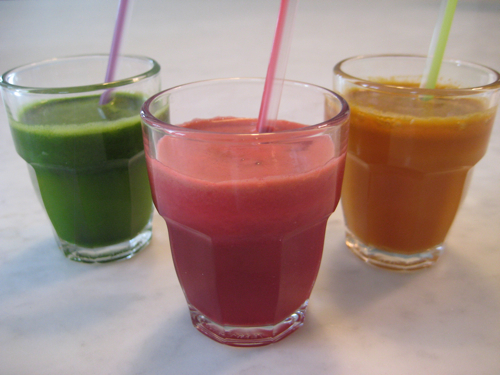 Below are three amazing juices for you to try. Enjoy! Want more recipes like these? Don’t forget to sign up for my monthly newsletter at http://www.thecaringcoachingcenter.com. It’s apricot season! 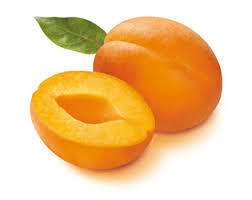 I find that most people I talk to only know apricot in the dried fruit form. If you’ve never had a ripe, juicy, fresh apricot, now is the perfect time to try them; they are in peak season, and they are delicious! Look for apricots that have a little “give” when you push on them with your thumb. You don’t want them mushy though! If you get apricots that are not quite ripe, just put them in a paper bag and store them for a day or two at room temperature. To remove the pit, just cut the apricot in half and pop the pit out. You can certainly just eat the apricot on its own, or, you can use them in one of the recipes below. Cut apricots in half and remove pit. Mix honey, cinnamon, brown sugar, and lemon juice in a small bowl. Brush the cut side of the apricots with the honey mixture. Place directly on clean grill, cut side down. Grill for 3 – 5 minutes. Serve with vanilla ice cream (optional). Mix all ingredients and top with vinaigrette dressing of your choice. A lovely orange-based dressing is amazing with this salad! Enjoy! If you make one of these dishes, comment below and tell me how it turned out! Want more recipes? Sure you do! Get my monthly newsletter and never miss a thing! Just go to http://www.thecaringcoachingcenter.com and click on the newsletter link. I ran a 5-k today to raise money for prostate cancer; I’ve been doing this run for three years in honor of my dad. My dad passed away from prostate cancer, so it seems like a fitting thing to do on father’s day. My dad was not your typical dad. I suppose most anyone could say that about their father, but I know that my dad truly was one-of-a-kind. If I’m being honest, I don’t think that I appreciated him as much as I should have when he was here; but I miss him now. My childhood was far from perfect, but I know my dad did the best he could with what he knew and what he had to offer; I know he tried hard! There are times when I wonder if he’d be proud of me now for all the things that I’ve been doing. I wonder what he would say about decisions and choices I’ve made and things that I’ve done. In the past year, I’ve done a lot of work on myself. I’ve been trying to deal with with my issues and work to become a better me. I haven’t always gotten things right, in fact, I’ve screwed up a lot things, but I’m a lot further along than I was. I think my dad would be proud of me. For all you dad’s, dads-to-be, step-dads, granddads, father-in-laws, pet daddies, uncles, brothers, and father-figures, thank you for all you do. For all those missing their dads today, I feel you. Be extra nice to yourself today. Here’s hoping you enjoy fond memories and thoughts of your dad. Summer is almost here! The days are getting longer and the sun is shining! While it’s good to get your daily dose of vitamin C, it’s important to make sure you’re practicing sun safety. Protecting yourself from the sun by wearing sunscreen with an SPF of at least 30, wearing long-sleeved shirts, and a wide-brimmed hat, will help you avoid the sun’s harmful rays. Here’s hoping all of you have a safe and happy summer! Want more great health and wellness tips? Sign up for my monthly newsletter. Just go to http://www.thecaringcoachingcenter.com and click on the newsletter link. It’s summer! It’s BBQ season! If you’re a vegetarian, backyard cookouts can be quite frustrating. You could always BYOB (Bring Your Own Burger) and not the frozen hockey puck ones from the grocery store. You could make your own; like these awesome bean burgers. Fixins – The possibilities here are endless, sliced avocado, sliced red onion, grilled onion, lettuce and tomato, sour cream, cheese of your choice; go ahead and go wild! 1. Lightly mash beans in a large bowl. Add carrot, chili powder, oregano, breadcrumbs, eggs, hot sauce, and salt and pepper. Stir until thoroughly combined. Divide into 4 portions and make patties. 2. You can certainly grill these if this is in fact a BBQ, or, you can make them on the stove top. Just heat 2 TBSP of oil in a nonstick skillet. Add patties and cook until bottom forms a browned crust and most of the oil is absorbed, about 10 – 12 minutes. Flip patties and add another TBSP of oil. Cook until browned on the other side, another 8 – 10 minutes. Serve with or without buns with toppings of your choice. Want more great recipes like these? Of course you do! Sign up for my monthly newsletter so you don’t miss out! Just go to http://www.thecaringcoachingcenter.com and click on the newsletter link to get yours! Karen Ann Kennedy is a Certified Health Coach and Board Certified Holistic Health Practitioner.